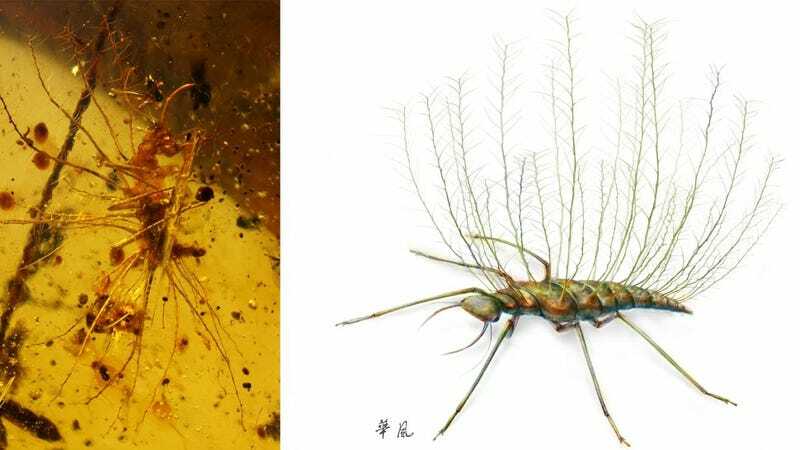 New evidence shows that insects were using camouflage to hide from their predators as many as 100 million years ago—and wow did these ancient bugs ever employ some strange forms of deception. Some larvae lived concealed and camouflaged in ground litter or under stones, lying in wait for prey. Other insects cloaked themselves using plant residue, wood fibers, dust, and lifeless shells of their victims. The researchers were stunned to see such complex behaviors in creatures that lived 100 million years ago. The samples, which came from Myanmar, France, and Lebanon, also show that many of these animals evolved these strategies independent of one another. As Rust explained, “Apparently, camouflage offers many advantages for the user, for which reason it was ‘invented’ multiple times during evolution.” And indeed, some of the tactics observed in these insects can still be found today.